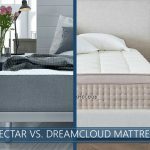 Casper vs. WinkBed Mattress Comparison for 2019 - Which to Choose? 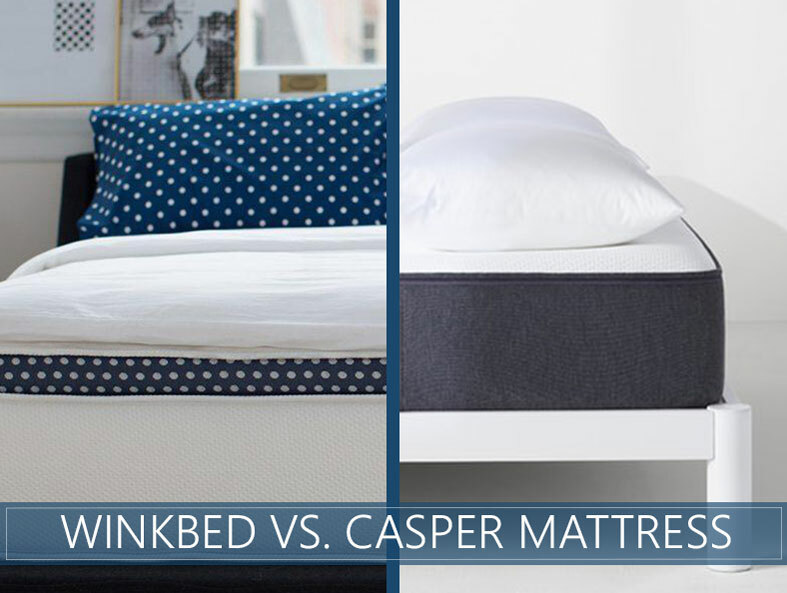 Our comparison of the Casper vs. WinkBed matches two brands with unique support systems designed to cradle your body in comfort while delivering exceptional spinal alignment. Which is best for you? Will it be the two levels of coils that combine conformance with support from a family-owned business in Wisconsin? Or will it be an all-foam zoned system from the well-known California brand that is tailored the body’s natural weight distribution and shape? This hybrid brand is compressed into a cardboard box. The plush cover is eco-friendly Tencel fabric that is tufted together with the comfort layers and wrapped around the 14.5-inch construction. Keep in mind that the other firmness options may vary in their construction slightly. The top layer contains 1 inch of soft, quick-response foam that conforms to the body’s shape and helps you reposition. The 2nd layer is built with Stabilizing Gel Foam that evenly cradles your body’s weight and wicks away heat. The third layer’s construction is made with Pocketed Micro Air-Springs™ measuring 2.4 inches that have enough give to conform to your shape. The 4th layer transitions between the coil units with a pre-compressed Lumbar Support Pad that is .75 inches tall. The next layer stands 8 inches high and is constructed with spine-supporting steel coils that are tempered for strength and pocketed to reduce motion transfer while promoting good airflow. The base supports the coils with 2 inches of foam. The perimeter reinforces the edges with 4.5-inch dense foam. Casper’s mattress is delivered to your home after being carefully pressed and rolled into a cardboard box. A durable and breathable polyester fabric covers the 12-inch structure. The top layer contains a 1.5-inch sheet of proprietary foam that delivers both comfort and bounce while allowing air to circulate through its open cell structure. The second layer’s high-density memory materials can trap heat away from the body while providing deep-level contouring and pressure relief. The base layer transitions between the comfort materials and the supportive base with proprietary 1.5-inch Zoned Support™ that can accommodate extra weight in the mattress’ center where the structure is firmer while still providing softer pressure relief at the top and bottom. The final layer supports the sleeper with 7 inches of dense and durable base materials. Our scale for firmness scores mattresses between 1 and 10, from cloud-soft to hard as a rock. 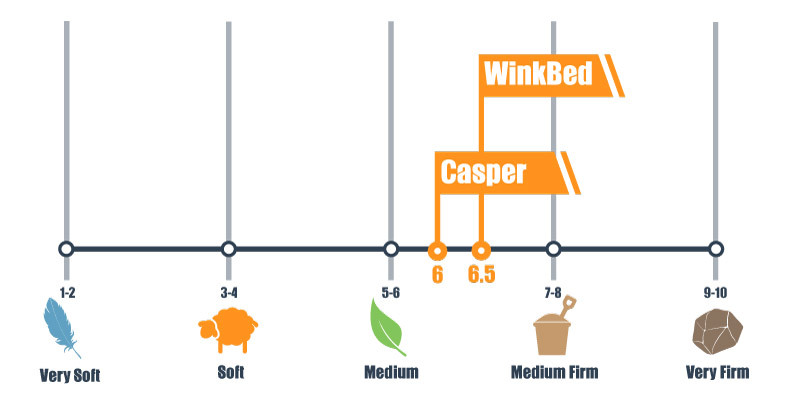 The Medium WinkBed scored a touch firmer at 6.5 than Casper, which scored at 6. Both scores fall within the range of a flexible comfort level that works with most individuals and their preferred sleep position. Though WinkBed is a hybrid bed, its feel leans more toward innerspring with some unique features that relieve pressure relief. The micro coils conform to your shape along with the top quick-responding layers. The cover’s luxuriously tufted plushness also adds extra comfort and pressure relief. The sturdy 8-inch springs provide excellent support, and the circulating air through the coils and around the body helps keep its temperature regulated, though this is also assisted by the inclusion of gel. Casper’s all-foam construction is a stark contrast despite the similar firmness level. The top layer is responsive and soft and conforms quickly to your shape. Your body will then slowly engage with bed’s next layer made from memory product that melts your pressure points without being close enough to the body to overheat. Zoned Support™ can prevent your midsection from bowing uncomfortably when sleeping on your back or stomach. Both brands work for a variety of shapes and sizes, but WinkBed does offer additional firmness choices if you need some additional softness or support in your mattress, as well as a Plus model for sleepers over 300 pounds. Casper’s approach is to design one extremely versatile model that suits a wide range of sleepers and body types. 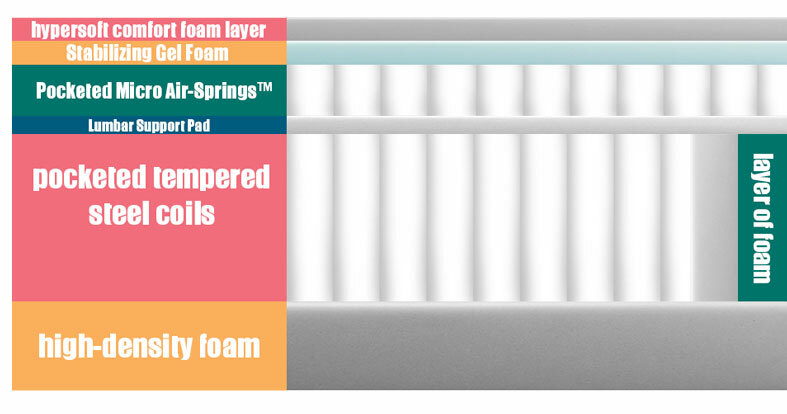 Both brands have a similar level of sinkage depth that holds the sleeper in a gentle cradle without letting them disappear into the core of the mattress. This assists temperature control in both structures because the body comes into contact with air that is circulating through your bedroom. Bounce on these mattresses is dramatically different. WinkBed has significant deep, medium, and surface level bounce that makes moving around on this mattress nearly effortless. However, Casper’s surface level bounce and cushioning depth help the sleeper from feeling stuck in one position. Despite traditional innersprings’ reputation for transferring motion, WinkBed is built with individually pocketed springs that can compress independently of each other, a feature that improves motion isolation with the help of comfort layers. However, memory materials and beds knock it out of the park in this category because of their minimal bounce and their ability to absorb vibrations, and therefore, Casper might have a slight advantage among very light sleepers who worry about middle-of-the-night disturbances from their partner moving around. WinkBed has put a lot of thought into their edges, reinforcing the sides of their coil units with thick foam rails that offer exceptional support for your weight in both the seated and prone positions. Bed-in-a-box brands with all-foam layering typically do not perform as well in this area, though Casper exceeds expectations here, and couples sharing this mattress should not feel as if they will collapse or bottom out on the sides when lying down or sitting. Should I Buy WinkBed or Casper? Have you made up your mind? Here are a few more highlights to help you decide if your sleep future includes coils or foam. Substantial weight accommodation. This brand’s 14.5-inch height and use of two supportive coil units help to support additional weight without feeling too firm for sleepers who are lighter. Folks over 300 pounds can opt for a Plus model. A hybrid construction. This brand combines the best features of both foam and coils to offer a unique blend of soft comfort and firm support that extends all the way to the edge. High-end temperature control. Innerspring mattresses tend to be the most temperature neutral because of the amount of air that can circulate through the mattress. The number of coil layers matched by cooling technology help to keep this mattress temperature regulated. You also have the option of buying a foundation with smart technology that allows you to set the product’s temperature with your smartphone. Bounce. There is a large amount of bounce here coming from multiple layers, and this feature has a significant impact on ease of repositioning. An all-foam feel. This memory mattress with slow-responding comfort layers and a thick base offers a unique feel that tightly hugs your curves without pulling you too deeply. Top-notch motion isolation. Sleepers who are looking to significantly cut down on the motion transfer, either because of a partner’s differing sleep schedule or a restless pet, will be pleased with the layers Casper has put together in this model. Budget-friendly option. Casper’s new model offers an updated approach to spine alignment and comfort that is $300 less than WinkBed for the Queen-size model. Versatility. Unlike other brands that offer more than one firmness level, Casper aims for just one versatile firmness that will adapt and accommodate a diverse population of body types and sizes, which is convenient when sharing with a partner with different sleep requirements. These brands offer very different feels and different features. 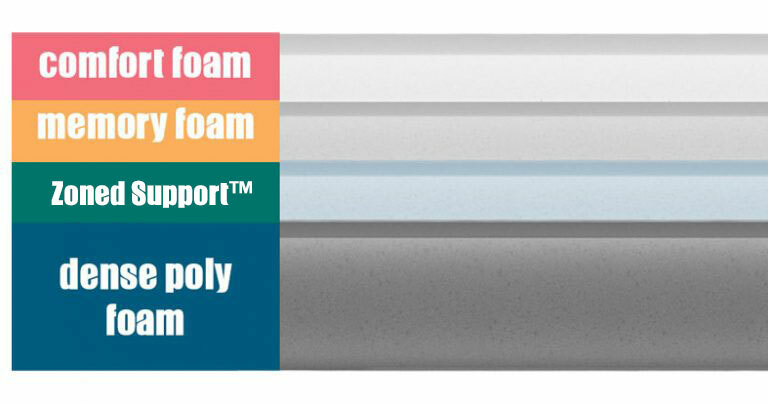 Do you want the motion isolation of foam or the cool comfort and bounce of an innerspring hybrid? Either direction you go, we think your back will definitely thank you for all the support. If you still have questions, you may find the answers you need in our in-depth reviews.